There are almost as many types of punches as there are parties. There is something celebratory about serving up a punch at your gathering and would you like the good news? They are a cinch to put together. 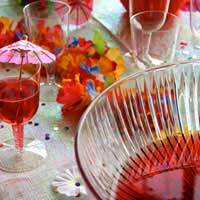 Read on and find out how to make your punch the centrepiece of your party. Punches are notoriously sweet and to get that blood sugar rush opt for syrup or honey rather than sugar. These alternatives tend to dissipate better than sugar in cold liquids, allowing you to make a balanced, well-flavoured punch. Punches are fruity and frequently involve pieces of chopped fruit making an appearance. Make sure that this fruit is chilled before it is added to the mix. This may even negate the need for added ice. You want to treat your guests and give them good food and drink but you might not want to use your finest bottles of alcohol for the punch. Use a medium quality brand and they won't even notice! Perfect for adults and children alike, this punch is perfect for family gatherings. If you do want to give it a grown up twist, feel free to add a healthy serving of vodka. add the bananas, strawberries and pineapple. Add the sherbet and slowly pour in the lemonade. As a rule, always add the carbonated ingredient last to a punch. Add ice if you need to keep it cool. A twist on the original classic Spanish drink, this zesty punch is dangerously addictive! Empty the drink mix in the punch bowl. Add the cranberry, orange and lime juice and stir until all juices are mixed together. Add the sliced fruit and slowly add the sparkling water. Serve in glasses with plenty of ice and enjoy! Your guests are in for a treat. A mixture of cognac and champagne make up the base of this extravagant punch. Add the oranges and the pineapple to the punch bowl and add the cognac. Let the ingredients steep for a few hours before adding slowly adding the champagne to the mix. Perfect for the winter months, this is the ideal alternative to mulled wine at Christmas parties. 2 tablespoons of rum and sliced apples and oranges for garnish. cider and honey/syrup and spices into a saucepan and heat gently. Don't let it boil, but simmer for 10 minutes. Add the rum to the mix before draining the ingredients through a sieve, to ensure that no bits of cinnamon stick are left in the punch. Add the fruit for garnish and serve whilst still warm. Punches can involve 2 ingredients or 12. Feel free to experiment with punches but always make sure that you sample it before you serve it!